Jacob Kainen (1909 – 2001) was a serious artist for much of the 20th century and a man of many talents: a painter and printmaker with numerous gallery and museum shows to his credit; an internationally known curator who helped build and manage the print collections at the Smithsonian Institution; a major force in creating the Washington, D.C. art scene; a scholar who published research on such subjects as 16th century mannerism, 18th century Venetian etchings and woodcuts, and German expressionism; a collector and patron of the arts; and a beloved teacher and mentor who generously gave his time to help fellow artists. Throughout his remarkable life, Kainen experimented with different mediums and explored many styles, yet he identified himself as a painter. 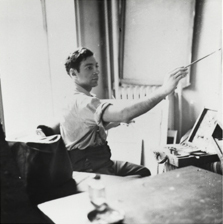 His work took root in the Social Realism of the 1930s, later becoming involved in the development of abstract expressionism. Fiercely independent and anti-establishment, he rejected labels and moved from visceral abstractions to figurative work to abstraction again, refining these styles at his own pace. His work became well known for its variations and diversity, color and form and explorations of light and space. Kainen participated in more than twenty-five one-man shows and many group exhibitions. Today his work is represented in the collections of the Smithsonian American Art Museum, the National Gallery of Art, the Museum of Modern Art, the Baltimore Museum of Art, the Yale University Museum and the Whitney Museum of American Art, among other public and private collections.